For more on this story, check out the Maroon podcast, On Beat. Richard D. Meland, an 80-year-old retired University janitor who passed away on January 25, was an avid collector. Rather than pursuing coins, antiques, or bottle caps, Meland was committed to his collection of guns. Meland owned several firearms and boxes of ammunition in his apartment on 5527 South University Avenue. Meland held all proper registration and permits for his guns. This did not save him, however, from catching the attention of authorities. On March 2, 1990, the Chicago Tribune reported that Meland, then 56, had been arrested by the police while loading more than 75 guns and several boxes of armor-piercing ammunition into his trunk—allegedly failing to provide proper documentation for the weapons. Kay Nelson, the chair of the board of the co-op in which Meland lived and Meland’s landlord in 1990, said that she knew of the incident, but said that the police were mistaken—Meland did, in fact, have all proper documentation for his weapons collection. “It turned out that [Meland] was falsely arrested; he had all of his permits. He sued the City of Chicago for false imprisonment, and won that case,” Nelson said. After Meland’s death, his relatives decided to voluntarily turn these possessions over to authorities. 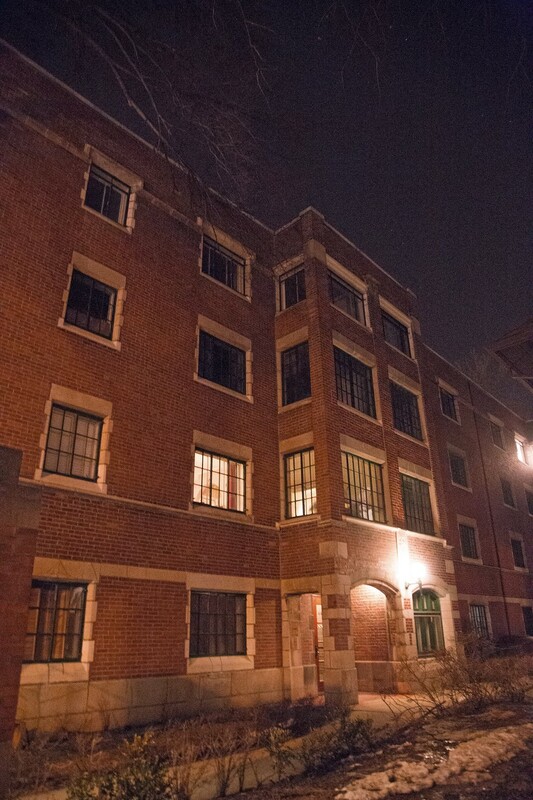 According to a copy of an incident report, Chicago Police Department (CPD) officers arrived on the scene at approximately 1:30 p.m. on February 20 to collect “live rounds and spent cartridges.” Nelson, who said that she oversaw the entry and exit of the CPD from the apartment complex, also said that the CPD took several guns in addition to the ammunition. Officers hauled heavy boxes into an armored police truck parked in the middle of the 5500 block of University Avenue. UChicago second-year Blaize Gervais witnessed CPD officers carrying boxes from the apartment complex and loading them into the armored truck. Gervais asked the officers what was in the boxes and was told that the officers had found “3,000 pounds” of ammunition in the apartment. When Gervais posted the conversation to the “Overheard at UChicago” Facebook group, other students suggested that “3,000 rounds” was more probable. The CPD police report did not record the amount of ammunition seized; Nelson said that while Meland possessed a large amount of ammunition, it is impossible to put a metric on exactly how much it was. “I have no way of measuring something like weight; some of [the ammunition] was in boxes, some of it was just lying around the apartment,” Nelson said. Nelson explained that she was happy with the CPD seizure as a means of getting rid of the ammunition. “I’ve always been concerned about safety [regarding Meland’s guns and ammunition]. But it was all perfectly legal, so it was his right,” Nelson said. Nelson also suggested that fellow residents of the co-op held similar sentiments toward Meland’s collection. “Other people knew about this; it was not a secret. And I think that nobody in the building likes the presence of guns or ammunition,” Nelson said. According to Nelson, the question of what to do with Meland’s gun collection arose immediately after his death, because he left no will. “[Meland] died intestate, so the ammunition didn’t belong to anybody. I’m involved in seeing that the apartment is emptied and sold, but I can’t touch someone else’s property. One of his cousins contacted the Cook County Office of the Public Administrator, and the case progressed from there,” Nelson said. The Cook County Office of the Public Administrator, according to its website, “provides estate administrative services for people who die intestate or for those decedents with no person or next of kin with the right or desire to administer the estate in Illinois.” According to Nelson, after the Office of the Public Administrator was contacted, it reached out to the CPD. The CPD then notified Nelson that it was going to take the guns and ammunition from Meland’s apartment.